cherpumple (chur-PUM-pul) — noun: a pastry desert consisting of a layer of cherry pie, a layer of pumpkin pie and an a layer of apple pie. Etymology not necessary, or so I’d like to think. It goes without saying that, at least verbally and seasonally, cherpumple is the dessert equivalent of turducken, that other Greek mythology monster of a dish that mashes three types of poultry into a single form. No, the apple component isn’t enclosed by the pumpkin component and the pumpkin not by the cherry, but you have to admit that the comparison still works. I learned about this fascinating, horrifying item on Fritinancy, a great blog for all things verbal, on which the item was actually described as being even more fattening: cherry layer inside white cake, apple layer inside yellow cake, pumpkin layer inside spice cake, with all three stories wrapped in cream cheese frosting. As if that weren’t enough to process after your yearly late-November gorging, I’ll give you one more: Fritinancy revealed to me the existence of what is essentially turducken + 1, an even more intimidating entity known as turbaconducken. "A bird in a bird in a bird in a bird in a bird in a pig." It kind of makes turdunken look healthy. Finally getting a chance to catch up on my google reader (hence being late to the comment party). Super excited to see Charles Phoenix on here! And then I read that I had made the introduction. 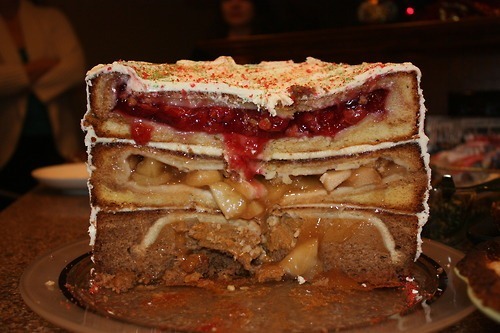 ;) On another note, one of my wedding clients actually MADE a freaking cherpumple for Thanksgiving this year. Nuts. Bloodie: I was wondering why people weren't trying to shove a game hen into the whole turducken situation. Now I know it has been done. Megan: I think I may be kind of obsessed with Charles Phoenix now. Does he still give those tours? He does! He actually said ours was the last "Disneyland tour" but I got an email a few months ago announcing that he was doing another one. If you go onto his website and sign up to get his "slide of the week" (right side of the blog, near the top) then you'll not only get awesome old photos every week, but you can get info on his upcoming events. We should go to one together!